This short story is based on the fan fiction challenge on page 210 of Polly Wants to Be a Writer. “Why don’t you believe me?” I asked. “No one will ever believe you, Amy. Please stop all this nonsense about werewolves and vampires,” my mother replied. I walked away with a broken heart. I didn’t know why people didn’t believe me. They said I was stupid. The world was not meant to be just for humans. There were other creatures that I believed in. Werewolves did exist. Vampires did exist. My curiosity for knowing more about them was always growing. My room had a huge collection of books and articles on those supernatural creatures. I picked up one. England’s unpopular King John, who reigned from 1199 to 1216, was said to have been a werewolf. The legend tells how monks, hearing sounds from his grave, dug him up and took his body out of consecrated ground. I was ridiculed in school. Even my friends didn’t believe my words. Today was not special. I noticed the smiling faces looking at me. I had grown accustomed to it now. I walked past the rusted iron door, entering the school grounds. The sky was a dark shade of grey, contrasting with the bright green grass below. Suddenly, a group of children started approaching me. “How are you, Amy? I just saw a vampire walking there,” said one boy, making fun of me. There was a chorus of laughter. I stood silent for a few seconds. Anger rolled over my body, but I couldn’t do anything. At first, I thought of replying to them with some clever words but soon realized that it was worth nothing. I started running. I didn’t know where I was going. The laughter soon faded out of my ears. I kept on running, still noticing the smiles of some children, and rushed out of the school. Soon, I felt kind of wet. Water drops were coming down from the sky. Ignoring the rain, I kept running. I was full of anger. The children must soon realize that I was right and they were wrong. All my relatives and friends were against me. I should run away from them, and I would. Soon, I came upon the woods. My pace slowed down, but I still kept running, not noticing the little scratches on my bare hands and legs caused by the sharp branches and stems. Gradually, my speed declined, and I came to a halt. Tears poured out of my eyes, not because of running so much, not because of the pain caused by the scratches, but by the pain the people of my species had caused me. I sat down to take a rest when suddenly the group of bushes beside me twitched. Taking into account that I was in a forest, I thought that it must have been some wild animal, looking for shelter from the rain. But something caught my eye. It was not much like an animal and not much human. Its body was bent and had a thick layer of black fur. I was in awe, amazed by what I saw. I rubbed my eyes and looked again. It was not a dream. There were werewolves on this planet! It was hiding from me. The werewolf started galloping deeper into the forest. I could have lost him easily, but I was alert, observing its every movement. It was agile, very athletic and never got disturbed by the webs of tree branches and stems. I started the chase with as much speed as I could. Sometimes it dashed into the thickets, sometimes behind a cluster of tall trees, and sometimes it climbed up on branchy trees. It must have known that I was following it, for the rustling of the leaves on the ground increased, and my breath produced a little sound, too. The forest led nowhere, and the creature went on with its galloping, deeper and deeper into the trees. I got a feeling that I may not find the way back now, so my only chance was to chase the werewolf and get to the place where it was going to. I became more cautious with my chase. I never lost it. It took a huge leap and vanished into a dark, eerie cave. I stopped there with my heart in my mouth. Could it be their home or some kind of base? I grew very curious and started to approach it. The cave was not naturally made, for its opening was a perfect semicircle, ridged with polished stones. The werewolves must have built it. While I was looking for clues, I came upon a small wooden plank. It had the words “Vampire Clubhouse” engraved on it. I was in disbelief. Was there really a clubhouse like this? And, if it was there, would I be allowed to join in? I had a fight with myself. My fears were that I may be humiliated there too and would not be allowed to join because I was human. But they must have some way to turn me into a creature like them. I overcame my fears and made up my mind to go inside the cave entrance. I was happy to leave this human world and join something for which I had a longing since my childhood days. But the fear of being rejected again came up. I insisted to myself that I would not be rejected. Bravely, I took my first step to becoming a werewolf. The other steps soon followed, and gradually my pace increased. I peered into the cave. I t seemed to go on forever. It was so dark that I could not even see myself. I grew afraid. The silence was scary. I thought that something might suddenly jump on me and kill me, but it didn’t happen. After walking a few steps into the cave, I saw a gleam of light coming toward me. My heart started thumping, and it caused my whole body to vibrate with fear. Soon, I started hearing different types of harsh, coarse voices. The language seemed familiar, too. After walking through such a dark forest and cave, the bright light at first made me go blind, but as my eyes grew accustomed to the light, I saw what I couldn’t believe. There were huge tables arranged in the high-roofed room, surrounded by large chairs. Sitting on them were none other than the werewolves and vampires. The sight at first made me scared, but I realized later that the creatures were friendly. They welcomed me warmly. I could not believe that this was true. I was in a cave in the forest being welcomed warmly by a band of werewolves and vampires! This could not be true. “Hey, what’s your name?” asked one of them. “You seem to be scared. Don’t be afraid of us,” it said soothingly. There was silence for a few seconds. Then a harsh voice from behind broke the silence. “You can definitely be a part of us if you like, but, after you have done so, there is no turning back,” said a vampire, coming forward. “Please turn me into a vamperwolf!” I requested. It got up and started moving slowly into a room. I followed it and kept a constant distance from it. It then pushed the door open and entered with his head bowed. The nameplate on the desk read “Manager.” I quickly understood and bowed too so as to show respect. “She must be if she answers my question. It must be a satisfactory answer,” ordered the manager in cold-blooded voice. I thought it might just not be enough to get into the club. But the manager seemed satisfied. “You have a good reason. I will not block your path to becoming a vamperwolf.” It then took out a box from a drawer, opened it and picked up a silver bullet. It handed the bullet to the vampire that led me here. The vampire accepted it with respect. “Get ready,” the vampire warned. It took out a vintage gun, partly made of wood and partly made of iron, loaded it with the silver bullet, and raised its hands to aim at me. I was about to scream when I heard the gunshot, and I felt sudden gush of pain. I almost died. As my eyes opened, I saw the other werewolves staring and smiling at me. I had been asleep on a hard, wooden bed. I rose up and was presented with a mirror. “Ew! It can’t be me! You are kidding, right?” I screamed in horror. I could not believe my eyes. I saw a big creature, covered with fur. My nails were long and sharp, my teeth were yellowish, and I had a very bad breath. 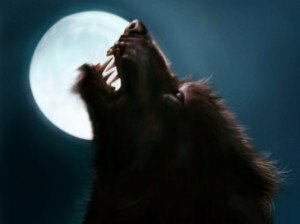 I wished that I could show the humans that werewolves did exist, and now I was one of them. Congratulations were showered on me. Life was never going to be the same again. Well written dude……..a small step for a giant leap I guess….